Imagine a customer who visits your store online or personally and likes your products but when he discovers that the payment needs to be made through cash or cheque, he leaves. This would be a nightmare for any growing business as all its marketing efforts to lure the customer in and offering product of his choice are spoiled just when the sale was about to be made. This could be averted if you had offered credit card acceptance. Below are Top Five (5) Best Alternative Ways to Accept Credit Card Payments for Small Business and Companies worldwide through credit cards reader machines and applications. Credit Cards are gradually becoming inevitable for merchandises in order to capture a large customer base that prefers payment through credit card. It has been estimated that, more than 30% of total purchases in US are made through credit card . No prudent business owner can remain oblivious to a share from this big piece of the pie. Modern Technology has also made it easier for business owners as they can now accept credit cards even with their phones through mobile credit card reader attached to it or through a contact-less NFC device where customers pay via phone by tapping the screen only. 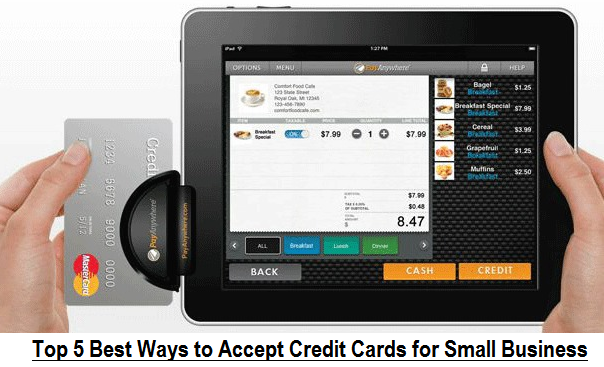 Today’s businesses can accept credit cards through any of the following ways. A traditional merchant account can be setup at any commercial bank by compliance of the local laws and payment of initial fees. Such accounts are the oldest way of accepting credit cards as all the transactions are made in the name of business who also manages cancellations and refunds by themselves. Payments are mostly made through POS machines. Although this form of accepting credit card is novel, but it comes at higher costs and hassle of managing transactions by yourself which may not be conducive to a small business. Nothing sounds more convenient than offering the customers the ability to click on the item of their choice as they navigate through your catalogue online and buy it right away. This was made possible through advent of internet payment service providers like PayPal, BitCoin, Google Wallet and many others. These payment gateways are responsible for processing the transaction securely and managing safety of credit card information, cancellation and refunds. In 2011, Visa expanded the category Internet Payment Service Providers (IPSPs) to Payment Service Providers (PSPs). The main idea behind this expansion was to bring into the physical world, the concept of third party merchant accounts which has already been operating for years to accept online payments. Leading payment gateways cashed on this opportunity and provided gateway services for Credit card payments made at POS thus enabling small businesses to accept payments without creating merchant accounts. Next step in the evolution of Mobile payment solutions was the idea of mobile processing aggregators. This was an effort to provide business owners with ease of accepting credit cards and that too at a very low cost. To achieve this goal, the payment service providers devised a strategy of maintaining one merchant account only which acts as a pool of all the sub-accounts of users which are managed separately by the service providers however, in actual they are all part of one third party merchant account. Service providers like Square, Group On are using this method; they also provide the business owner with mobile attachable Credit card reader to make the transaction. As the time flies, grey of the innovators around the world are coming up with latest ways of mobile payments which have the potential to change the way we make our everyday transactions. For instance, Boloro is a mobile app which links the bank account, wallet account and even the telco account of customers with their mobile phones and merchants can receive payments from such customers through a mere tap of the phone which transmits NFC signal to initiate the transaction thus avoiding the customary swipe of the card as well. EE Cash on tap and ZMAZZ are also examples of contact-less NFC bases mobile payment solutions.